Generally accepted methods of accounting for the environmental benefits of clean energy and technology do not yet exist. However, experienced investors know that what gets measured gets managed. Environmental Capital Group has pioneered an environmental due diligence and performance assessment framework for private equity investment, and we work hard to continually improve upon it. Our framework synthesizes the discipline and drive of venture capitalists, the industry and technology expertise of entrepreneurs and technologists, and the insight and critical review of top researchers. In conjunction with scientists and engineering advisors, ECG has developed an innovative method for measuring and quantifying the environmental benefits of underlying portfolio companies. This method involves qualitative assessments before fund investments are made, as well as ongoing quantitative analysis and monitoring at the portfolio level. 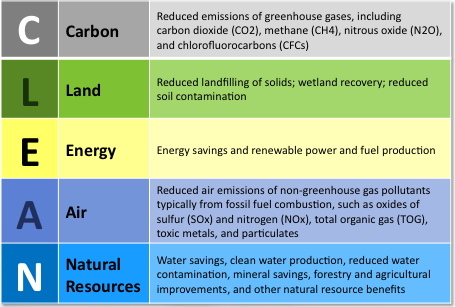 One of the frameworks we have developed compiles diverse environmental benefits into a simple, yet comprehensive summary: CLEAN Environmental Investment Benefits. The environmental benefits tracked include resource savings and emission reductions, with the key environmental benefit being the reduced use of fossil-based energy through improved efficiencies or replacement by renewable sources. The net environmental impact of renewable fuels is an active focus for ECG, universities and government agencies. When necessary, we consult with our advisors at leading research institutions - including UC Berkeley, Princeton University and Stanford University - to understand the latest thinking on all the impacts of the application of new technologies, for example: life cycle analysis, embedded energy, embedded water, secondary land use, and crop redistribution. See Environmental Capital Group's Environmental Investment Classes.